Below is a list of all 729 matches played. It is based on one compiled by John Madigan in The Maher Cup and Tumut, and includes additions and corrections. Madigan credited Wal Galvin of Cootamundra for first publishing the list in the Group 9 Year Book of 1978.
more than 2500 hypertext links to online full-text newspaper articles available via Trove. Further links are being added as more local newspapers are digitised. references to reports and photos in the pages of the books in the bibliography. Download the Teams and Scorers PDF file for complete team lists where known and the scorers in individual matches. If anyone can assist with scanned newspaper clippings and/or team photos I, and fellow Maher Cup researchers, would be most thankful. Wednesday, 14 July 1920 Tumut 27 Gundagai 6 Also recorded as 26-6. My article, Rules as at 29 June 1920 ; Team lists in Tumut & Adelong Times ; Gundagai Times team list; lists in Adelong & Tumut Express preview ; Tumut & Adelong Times report ; Adelong & Tumut Express report , Gundagai Times report , Cootamundra Herald mention ; Crowd about 500 ; “Union Days” and first team lists in Madigan,p.5-7. Wednesday, 16 August 1922 Gundagai 6 Tumut 10 Advertisement for 2 August match ; Originally scheduled for 19 July and then 2 August – due to flooding ; Advertisement – Gents 1/- , Ladies & children over 16 6d , school children free ; Crowd about 1500 ; Gundagai Times report ; Adelong & Tumut Express report ; Gundagai Independent report , Protest lodged by Gundagai (turned down) ; Tumut & Adelong Times report ; protest – Tumut & Adelong Times ; protest still an issue in Gundagai in September. Wednesday, 20 June 1923 Cootamundra 10 Gundagai 4 Gundagai Independent report, Gundagai Times report , Cootamundra Herald report and 2nd page ; Crowd close to 1000 ; both sides with ex-Sydney coaches, first with Sydney referee, Freestone brothers on opposite sides. Wednesday, 27 June 1923 Cootamundra 19 Temora 3 430 people from Temora by train ; Cootamundra Herald report . Wednesday, 23 September 1925 West Wyalong 4 Cootamundra 6 Advertisement ; Wyalong Advocate report , Cootamundra Herald report ; Gundagai Independent – 3000 crowd, 2/- admission ; dusty ground. Brian O’Connor hurt and never played again. Wednesday, 7 September 1927 Gundagai 17 Young 8 Advertisement – 1/-, cars 1/- ; Gate £52 , crowd 1500 ; Gundagai Independent report, Gundagai Times report , score also given as 17-7. Wednesday, 19 September 1928 Cootamundra 25 Barmedman 12 Gate £21/19 ; Cootamundra Herald report ; Cowra forfeited game due to Canowindra issue. Wednesday, 4 September 1929 Junee 2 Cootamundra 0 Gate £135 ; The Sun detailed report ; Cootamundra Herald report ; Gundagai Independent report; Wagga Daily Advertiser report ; Wagga Daily Express report; Match ordered to be replayed ; Final decision ; Coota defies NSWRL ; Executive replaced ; Coota appeal ; idea to end the Maher Cup ; Police address players before game; Barmedman & Junee both claimed the Cup (Sheehan, p.23); first time gate money was divided between teams (Sheehan, p.24) ; eggs thrown at Coota ; Daily Telegraph on eggs; Tom Case kicked goal from half-way. Wednesday, 18 September 1929 Barmedman 22 Young 3 Gate £30 due to Temora Show, Cootamundra Herald report, Brief report ; Also recorded as 24-3, 23-3 & 27-3. Wednesday, 4 June 1930 Barmedman 11 Cootamundra 7 Season preview ; Sportsman match preview ; 3000 crowd and £250/£240 gate at 2/- ; Big crowd left Coota ; Cootamundra Herald report ; Wagga Daily Advertiser sidelights ; Albury Banner report ; 9 imports in the Coota team – lost and then sacked (Sheehan, p.26). Also incorrectly recorded as 11-3. Wednesday, 14 September 1932 Junee 10 Temora 11 Gate £86 ; “Huge crowd” ; Cootamundra Herald report ; Wagga Daily Advertiser report ; Gundagai Independent report ; Coota forfeited final game and Young did not play. Wednesday, 28 June 1933 West Wyalong 7 Temora 28 Played at Barmedman; Gate £190/7/6 ; scores ; ‘Plume” Hay flown to game ; 438 on train from Wyalong, 350 from Temora, West Wyalong refused to hand Cup over (also Sheehan, p.31) Disputed by Campbell, p.71. ; Cootamundra Herald report ; Young pulls out of 12 July match. Wednesday, 23 August 1933 Temora 15 West Wyalong 19 At Barmedman. Also recorded as 12-17. ; Albury Banner brief report ; poor attendance £32/7 ; Decline in football crowds. Wednesday, 2 May 1934 West Wyalong 14 Cootamundra 2 Gate £64 ; Cootamundra Herald report ; Gundagai Independent report ; Wyalong had protest ready for use if they lost. Wednesday, 15 May 1935 Cootamundra 5 Tumut 13 Cootamundra Herald report ; Coota sacks imports ; Gundagai Independent report ; Wagga Daily Advertiser report ; reception at Tumut ; contention that paid players ‘sold the game’. Wednesday, 23 June 1937 Young 18 Cootamundra 5 Gate £136 ; Tallimba scheduled but withdrew ; Preview ; Cootamundra Herald Report ; Wagga Daily Advertiser report ; Albury Banner report. Wednesday, 11 May 1938 Cowra 10 Harden-Murrumburrah 7 Gate £27 ; Grenfell Record report ; First live to air broadcast on 2LF (McCarthy, p13), (Madigan,p.24). Wednesday, 24 August 1938 Young 8 Barmedman 2 Gate £19 ; Brief SMH report ; Brief Wagga Daily Advertiser report ; Also recorded as 8-6; in pouring rain. Wednesday, 14 June 1939 West Wyalong 2 Barmedman 2 Gate £92 ; West Wyalong Advocate report; Brief Grenfell Record report ; scorers ; first match broadcast at West Wyalong. Wednesday, 9 August 1939 Young 13 Grenfell 9 Gate £146/15/- ; Game postponed from previous week – flooded ground. ; Grenfell team for 2 August game ; Grenfell Record report ; Cootamundra Herald report ; Imports Grenfell vs Young ; following complaints about postponement – no postponements permitted from 1940. Wednesday, 5 June 1940 West Wyalong 22 Barmedman 5 Gate £72 ; West Wyalong Advocate report; Brief Cootamundra Herald report ; After match Barmedman disbands – many players enlisted. Wednesday, 24 July 1940 Young 0 Harden-Murrumburrah 5 Gate £63 ; Murrumburrah Signal report ; Young Chronicle report ; Cootamundra Herald report ; first newspaper report stating that no protest submitted ; Hailstorm (McCarthy, p.16) . Wednesday, 12 September 1945 Cowra 13 West Wyalong 10 Gate £90 ; Played at Young ; Wagga Daily Advertiser report ; score also recorded as 13-5. Saturday, 12 August 1950 Junee 17 Cowra 13 Gate £104 ; Preview ; Wagga Daily Advertiser report ; also recorded as 15-13. Saturday, 16 June 1951 Barmedman 13 Gundagai 13 Gate £250 ; preview ; Wagga Daily Advertiser report ; Game”still talked about” – report (Sheehan, p.50) ; Two minutes silence for Ben Chifley’s death. Saturday, 9 April 1955 Barmedman 72 Junee 3 Gate £150 ; Junee played almost all game with 11 as two players injured. Saturday, 21 May 1955 Temora 0 Young 21 Gate £699 ; crowd almost 5000 ; Dally Messenger attended the match ; Temora protest against playing of Alan Hockley eventually upheld. Saturday, 27 August 1955 Young 29 Cootamundra 12 Gate £316, crowd 2,000. Saturday, 9 June 1956 West Wyalong 23 Barmedman 5 WW & Temora played a rugby union curtain-raiser before game (Campbell, p.135). Saturday, 16 June 1956 West Wyalong 22 Harden-Murrumburrah 4 Also recorded as 22-8 and 22-15 (McCarthy,p.25) ; Harden team (McCarthy, p.25). Saturday, 13 July 1957 West Wyalong 7 Gundagai 0 Gate £268? Saturday, 14 September 1957 Barmedman 7 Boorowa 20 Gate £99 ; Report, Boorowa team photo & match program (Ryan, p.113-114); Boorowa team photo (Hughes,p.121). Saturday, 7 June 1958 Harden-Murrumburrah 8 Tumut 10 Tumut team (Madigan,p.48) , also recorded as 3-10. Saturday, 13 September 1958 West Wyalong 3 Harden-Murrumburrah 20 Match report & Harden team photo (McCarthy,p.35-37); Terry Gathercole kicked off. Saturday, 4 April 1959 Harden-Murrumburrah 17 West Wyalong 5 Gate £328 ; Protest by WW & match report (Campbell, p.145) ; Match report (McCarthy, p.40-41). Saturday, 11 July 1959 Harden-Murrumburrah 44 Boorowa 12 Boorowa’s last game, report, match program (Ryan, p.117-118). Saturday, 22 August 1959 Harden-Murrumburrah 14 West Wyalong 5 Gate £208 ; Match abandoned 2 minutes before half-time due to West Wyalong partial walk-off. (Sheehan, p.60), (Campbell, p.147-148) ; Match report (McCarthy, p50-53) ; brief report (Madigan,p.49). Saturday, 29 August 1959 Harden-Murrumburrah 36 Tumut 4 Report on Harden successful year (McCarthy, p.54-55). Saturday, 7 April 1962 Gundagai 14 Tumut 7 Gate £339 at 4/- ; 10 Tumut players went on strike (Sheehan, p.84) and (Madigan,p.54-55). Saturday, 21 April 1962 Gundagai 8 West Wyalong 23 Gate £264 ; Gundagai wins protest against West Wyalong playing Scriven (Campbell, p.160). Saturday, 6 April 1963 Gundagai 19 Temora 4 Gate £363, 1,815 paying at 4/-. Saturday, 20 April 1963 Gundagai 20 Junee 7 Gate £297/4/- ; crowd, with kids, 3000. Saturday, 9 May 1964 Gundagai 9 Young 11 Gate £190/16 ; Young team all local except for Peter O’Connor. Saturday, 7 August 1965 Tumut 15 Grenfell 0 Game played in snow; Gate £102, abandoned 19th minute 2nd half, (Hughes, p.96) ; Report and photos (Madigan, p.60-63). Saturday, 14 May 1966 Barmedman 11 Young 7 Junee, along with Tumut & Gundagai, joined the rebel Murrumbidgee Rugby League & had to hand the Cup back. Barmedman and Young drawn from a hat. Interest now definitely waning in the Maher Cup. (Hughes, p.99-100) also (Campbell, p.173-174). 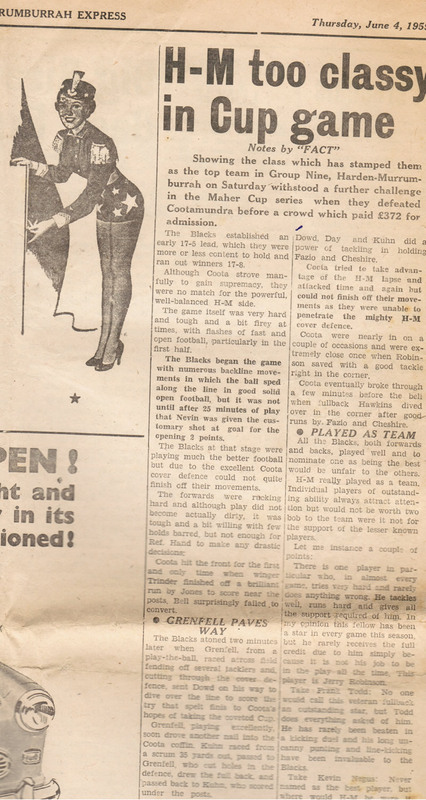 Saturday, 20 May 1967 West Wyalong 27 Young 5 Four tackle rule in place ; Maher Cup suspended ; Gate £336 ; Teams (Hughes, p.102) ; Cootamundra joined the MRL, Group 9 split up, appeal of Cup lost (Campbell, p.178 & 184) ; Four tackle rule introduced (Hughes, p.101) ; West Wyalong team (Campbell, p.180). Saturday, 10 June 1967 West Wyalong 27 Wyangala Dam 2 Gate $403 and brief report (Hughes, p.102) ; Brief reports (Campbell, p.180). Saturday, 12 July 1969 Wamoon 14 Cootamundra 0 Gate $137 ; Wagga Kangaroos forfeited their game against Wamoon; Coota rests best players for Sunday comp. game ; problems with Wamoon and Group 9 (Hughes, p106). Saturday, 2 May 1970 Cootamundra 12 Temora 10 Gate $178.50 ; Draw made for teams to play following cup taken from Wamoon (Hughes, p.111) ; Gate $178. Saturday, 5 June 1971 Young 4 Tumut 43 Gate $422.40 – 800 crowd and brief report (Hughes, p.114); photos of the final match teams (Hughes, p.115). Report and team photos (Madigan,p.66-70).